The Chamber is gearing up for the awards banquet on May 4th. 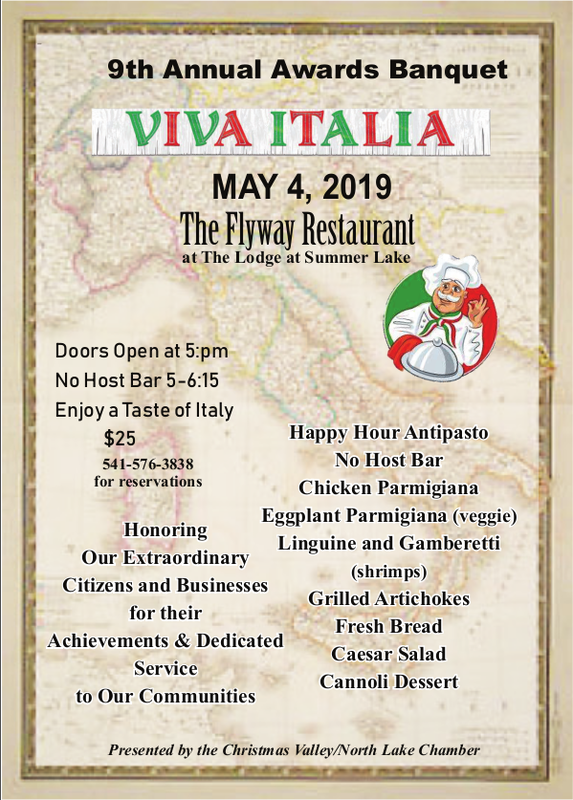 We are excited that the 2019 event will be held at The Flyway Restaurant, at The Lodge at Summer Lake. We encourage residents of and visitors to our wonderful Oregon Outback to come share a meal, cheer on the deserving award-winners and enjoy, company of friends and meet some new folks too. The Chamber is already receiving reservation requests so if you are thinking about joining in the festivities you might want to give them a call at 541-576-3838 or text your request to 541-480-0753. In addition to awards presentations and a keynote presentation; and thanks to the generosity of our business community, we will once again have a fabulous array of raffle gifts.